Looking to enhance your outdoor cleaning resources? Edisons now bring you an exclusive offering featuring a complete line of highly dependable Baumr-AG and MTM Petrol Leaf Blowers. With these powerful tools on hand, you can do more than just remove leaves and debris from any garden, backyard or outdoor setting. Each Baumr-AG and MTM Petrol Leaf Blower is ergonomically designed to provide a more convenient user experience. Now you can get the job done without putting too much strain on your back and arms. Key features include a patented recoil system for easy starting, an industrial grade motor for superior power and a commercial size fuel tank for less interruptions. Combining toughness and portability, Baumr-AG and MTM Petrol Leaf Blowers have a narrow nozzle design for optimum power when removing leaves and dust from crevasses. Also remarkable are the super flexible outlet chamber, ergonomic control with throttle lock function and convenient carry handle. 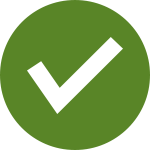 Completing every purchase is a comprehensive package of bonus accessories which include items such as fuel mixer bottles, tools and nozzle attachments. 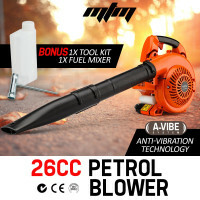 The Baumr-AG and MTM Petrol Leaf Blowers pack some serious punch, enough to make the other blowers out there look weak. They are perfect for clearing gardens, patios and driveways of leaves and other foliage debris. Some models have a blower/vacuum combination function which saves time while tidying up your lawn in the most efficient way. In addition to Baumr-AG and MTM Petrol Leaf Blowers, Edisons also offer Electric Leaf Blowers as well as accessories. You can also find a wide selection of reliable garden power tools which can easily expand your cleaning resources. These include Electric Chainsaws, Petrol Chainsaws, Electric Lawn Mowers, Petrol Lawn Mowers, Electric Log Splitters, Petrol Log Splitters, Diesel Log Splitters, Wood Chippers and so many more. Enjoy the pleasures of having a clean and clear yard. 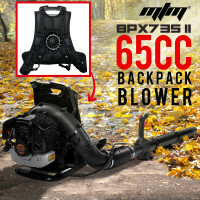 Order a Baumr-AG and MTM Petrol Leaf Blower today.